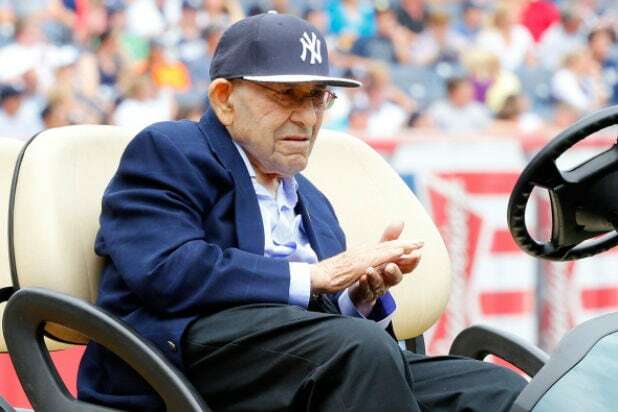 Baseball legend Yogi Berra has died at age 90. The passing of the New York Yankees icon, who was inducted into the Baseball Hall of Fame in 1972, was confirmed on Twitter by the MLB on Tuesday night. Berra played in 21 World Series and won 13 with the Yankees. An 18-time All-Star and three-time American League MVP, he batted .285 for his career with 358 homers and nearly 1,500 RBI. Famous for his whimsical sayings such as “When you come to a fork in the road, take it,” “You can observe a lot by just watching,” and “It ain’t over till it’s over,” Berra won the hearts of sports fans across America. Born Lawrence Peter Berra in 1925 in St. Louis, Missouri, to Italian immigrant parents, Yogi earned his nickname from an early teammate who said he looked a Hindu yogi whenever he sat with arms and legs crossed waiting to bat or while looking sad after a losing game. When his local team, the St. Louis Cardinals, spurned him, he accepted a $500 signing bonus from the Yankees in 1942 to play for their minor league team. World War II and a stint in the U.S. Navy — including at the D-Day invasion of France — delayed his professional career, but he would go on to play over 100 games during 14 years in the major leagues. Retired as a player in 1963, he managed the Yankees to the World Series in 1964 and the Mets to their “Ya Gotta Believe” World Series appearance nine years later. After being fired as Mets manager in 1975, Berra coached with the Yankees from 1976-1983. He managed the team from 1984-85, until he was let go in a contentious move by owner George Steinbrenner. The pair did not speak again for almost 15 years. Berra is survived by sons Larry, Tim and Dale, 11 grandchildren and one great-grandchild. Carmen, his wife of 65 years, died in March 2014.